Volunteers are essential to our program’s effectiveness. They help carry the workload and are the true motivators and cause of our young peoples’ success. More important than any other employment position, a volunteer is SquashEmpower’s greatest asset. 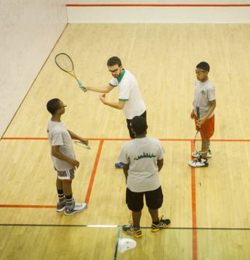 From squash coaching, to mentoring and academic tutoring, a volunteer’s role is critical to the success of our program. We intentionally engage individuals and groups of all backgrounds to work with us to help influence and ultimately transform a young person’s life. We need interested individuals to serve as academic tutors, squash instructors, mentors and chaperones for field trips and/or community service activities. As a volunteer, your eligible to receive recognition from the President’s Volunteer Service Council, school community service hours (as needed) and other periodic, “volunteer’s only” incentives. Over the past several months we have had discussions with a number of administrators from DC Public Schools. They have indicated a desire to partner with us, to ultimately see our program in place in multiple schools. By starting one school at a time, the Mayor’s office believes that having a program in place and operational can shorten the school-by-school process, by allowing principals, Athletic Directors, and teachers to see the program in action. Our next step with DCPS – over the coming weeks -- is to review facilities that may be available and also discuss the process to obtain space at such locations. Until we have our first home base court built, we are running a pilot program for 6-10 students at the University Club or Chevy Chase Athletic Club; we are extremely grateful for their support.